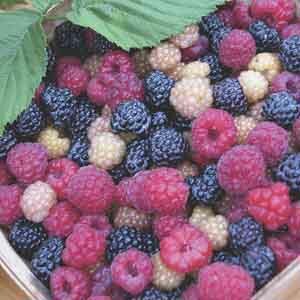 Raspberries, whether red, gold, or black, are a delicious seasonal treat, but can also be easily frozen for year round eating. While care is simple, the exact pruning, fertilizing and support structure needs will vary and should be researched, by variety chosen, to get the fullest fruiting and enjoyment. Plant in a reliably sunny spot. Best in fertile, well-drained soil. Keep well-watered during hot weather. Allow fruit to fully ripen before harvesting.